Through a partnership between the Housing Authority of the County of Los Angeles (HACoLA) and the Los Angeles County Community Development Foundation (CDF), 28 individuals who participate in HACoLA’s Public Housing and Section 8 Housing Choice Voucher programs received assistance to help make their educational and career goals a reality. 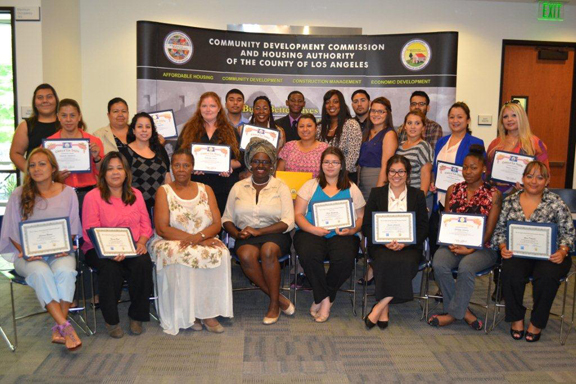 This year, over 50 Section 8 participants and Public Housing residents submitted applications for the Housing Authority Resident (HAR) Scholarship to the CDF. Each applicant was carefully screened and 28 awardees were selected. With the support of Union Bank, and other donors, the 28 awardees will receive grants valued at $750 or $1,000, to be used to attend a 4-year university, community college, or vocational program. The scholarship awards can be used toward tuition, books, equipment such as computers, and any other school related expenses. This year’s awardees will attend 4-year schools such as the University of California at Berkley, California State University, Los Angeles, Whittier College, Cornell, Pepperdine, and DePaul University in Chicago; as well as local colleges in East Los Angeles, and Long Beach. Students will pursue careers in criminal justice, medicine, social work, nursing, and engineering, among others. For more information on the CDF, or the HAR Scholarship fund, contact Jennifer Blackwell-Trotter at (626) 586-1899.